Thank you for booking with us. Here is everything you need to know. If you’re booking for a group please forward this information to everyone in your party. If you can’t find what you’re looking for here, please search our frequently asked questions page or, if you’re still confused, please get in touch. Our meeting place is Baltic Wharf, Cumberland Road, Bristol BS1 6XG, right next to the Cottage Inn. 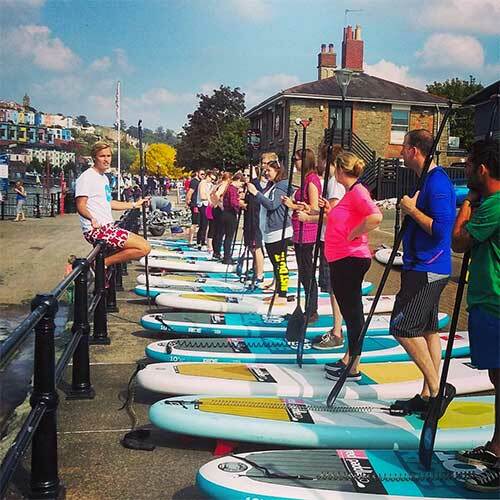 We’ll meet you on the quayside and you’ll see a row of paddleboards. We’re a 30 minute walk from the city centre or a short ferry journey (ask for a ticket to the Cottage). There is free parking on site at the Cottage Inn but it is first come first served. 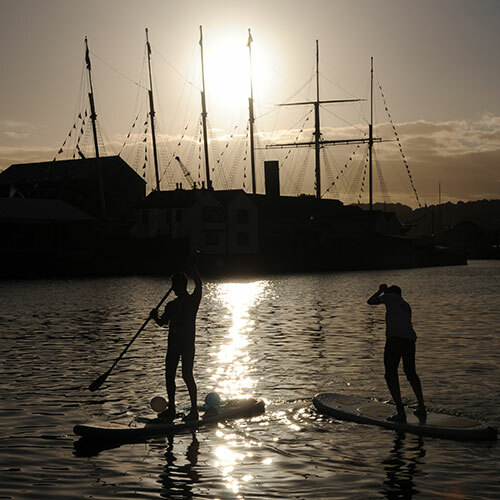 Our nearest pay and display car park is at the ss Great Britain (follow the brown signs or use BS1 6JR), a ten minute walk along the harbourside. We recommend travelling by foot or bike if you’re local. Please bring clothes you don’t mind getting wet. Dress for the weather – sportswear is ideal. We like to paddle barefoot but please bring old trainers or flipflops as we’ll be walking a little way with our boards. Please try to avoid heavy cotton or jeans, just in case. Bring a change of clothes and a towel if you fancy a shower afterwards. If it’s chilly we’ll offer wetsuits and jackets, but most people choose to wear their own clothes during summer. If you’d like a wetsuit please bring swimwear to wear underneath. We’re happy to store your valuables while you’re on the water. We lock them securely away but belongings are left at your own risk. 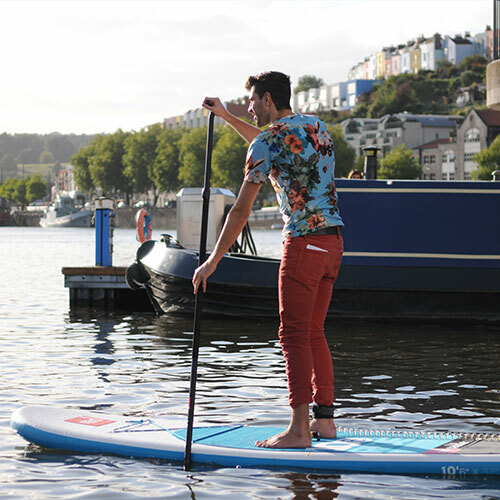 Whilst you’re welcome to wear old trainers on the water, in summer we love paddling barefoot as it gives you a better feel for the board. Please bring a pair of shoes or flip flops for walking around on the bank before and after the session though. Under 18’s should bring a pair of shoes to wear during the session. We aim to start each session promptly please arrive five minutes before the start of the session. If you’ve booked a public session we may not be able to delay the start to wait for you. We start promptly so please arrange to arrive a few minutes early. We may not be able to delay a public session if you’re running late as it’s not fair on the rest of the group. If the session has already started when you arrive we will not be able to refund your booking. At busy times we may not always be able to answer calls at the start of sessions, so please arrive on time. Please assume your session is going ahead unless you hear from us. We aim to go out in all weathers! The only reason we’d cancel is in the case of very strong wind or thunder and lightning. If we need to cancel we’ll do our best to give you 24 hours notice and let you know by email or text message. If we have to cancel your session we’ll look to reschedule. If that’s not possible we’ll offer you a full refund. Whilst our priority is your safety, we’ll do our best to take some photos of your session. We don’t advertise this before you book as it can be difficult to get good shots from a paddleboard! 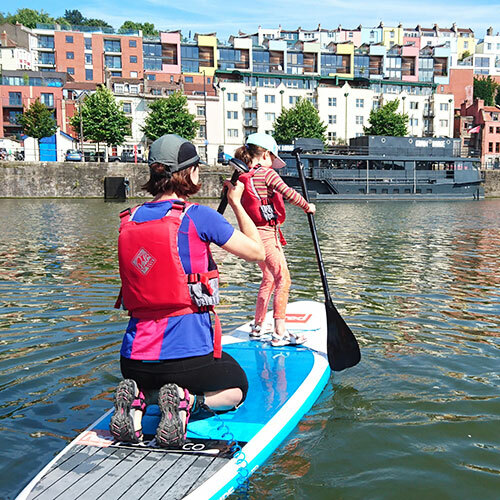 We’ll do our best to upload photos to photos.supbristol.com. If you’d like us to take a particular shot please ask. If you’d like to bring your own camera out on the water you’re very welcome. Just make sure it’s waterproof and floats – just in case! If you’ve enjoyed your time with us please consider leaving us a quick review on Tripadvisor.